Now with VWP, the best Cleaner/Sterilizer (not included worldwide in Coopers equipment because of different international regulations on chemicals). The new DIY Beer Kit includes everything needed to make 23 litres of great tasting beer - a patented fermenter that makes brewing even easier and quicker, an easy to read plastic hydrometer specifically made for beer, plus an Instructional DVD ROM to answer all your brewing questions. And a free upgrade to Coopers Canadian Blonde (the best session beer in our opinion); we want your first homebrewing experience to be a sucess . . . its better business for us. 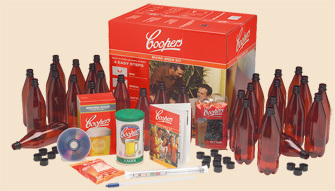 Probably the most popular beer starter kit in the world, developed by the Coopers brewery in Australia. Coopers are the only brewery making homebrew kits; these kits are by far most popular homebrew kits in the world today. Everything needed (except a can-opener) to brew beer is available in a box that fits easily into the kitchen cupboard. Also included in the kit is a detailed instructional booklet and accompanying DVD, ensuring that even the most novice brewer can be confident of getting it right, first time. The starter kit they use is this one (the old version).